Aquaculture of molluscs, especially of bivalve molluscs, is unique from several points of view. Aquaculture of molluscs, especially of bivalve molluscs, is unique from several points of view. It is one of the earliest forms of marine aquaculture practised in the western hemisphere, starting from early Roman times. Being sessile and low trophic level filter-feeders for most of their lives, molluscs can be raised at relatively low cost. Culture is carried out mainly in open waters, often in their natural habitats with young ones (spat) collected from the very same area. Historically, culture has contributed sub-stantially in the maintenance of capture fisheries for bivalves like oysters, and it is for the enhancement of oyster populations that fisher-men have readily taken to aquatic farming methods. Despite favourable climatic conditions, the availability of inexpensive labour and the need to produce protein food at low cost in tropical countries, most of the bivalve culture has developed in sub-tropical and temperate climates, as in the USA, Japan, Korea, France, Spain, the Netherlands and Italy, where they form high-priced luxury foods. aquaculture is that it involves transfer of juveniles from areas of high spat-fall to areas of good growth. Similarly, there have been several introductions and transplantations of exotic species, especially oysters, for enhancing or replacing stocks, and it is believed that these account for the occurrence of a number of exotic diseases among molluscs. There are several species of bivalves and a smaller number of gastropods which are cultivated. Among these the more important are the oysters (family Ostreidae), mussels (Mytilidae and Aviculidae), clams (Mercenaridae), scal-lops (Pectenidae), the abalone (Haliotidae) and the cockles (Arcidae). The group that accounts for the largest production of molluscs through aquaculture is the oysters and several species are cultured in many parts of the world. The culture of mussels and clams is more restricted, but the production of mussels in some countries such as Spain has reached high levels, which give rise to marketing problems. Other species are cultured only on a small scale or are in the experimental stages. 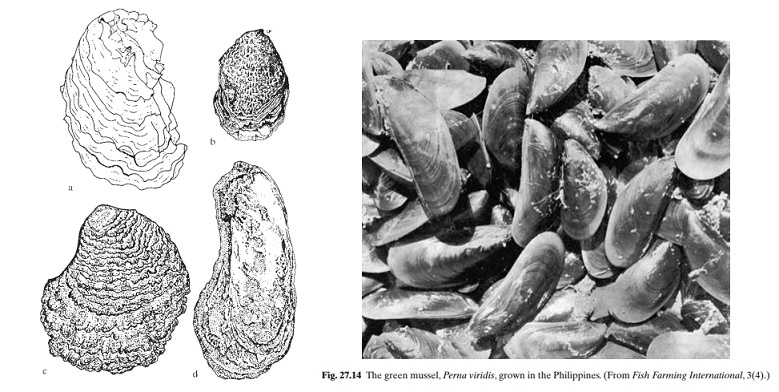 The farming of pearl oysters (family Pteriidae), though highly developed in Japan and initiated in a number of other countries, does not fall within the scope of this chapter, as it does not contribute to food production. The gastropod topshell Trochuscornatus is cultured on a small scale in Japanand Korea, and T. niolticus on an experimental scale in the Caroline Islands. The queen conch Strombus gigas of the Caribbean has been bredin captivity and the larvae reared through meta-morphosis. As the feasibility of commercial culture is uncertain, greater attention is now being devoted to the possibility of enhancing the diminishing natural populations throughstocking with hatchery-produced young. Considerable progress has been reported on the controlled breeding and rearing of the giant clam, Tridacna gigas, in Australia and other Pacific Islands, indicating the possibility of commercial farming of the species. A review of mollusc culture methods followed in different countries shows that large-scale commercial farming in most areas adopts extensive systems, depending largely on wild seed stock and natural food production. Natural reproduction is often augmented by concentrating brood stocks and providing substrates for spat settlement. The use of suitable and improved sites for different phases of growth and fattening and the eradication or control of pests and predators are the essential elements of the system. Besides the design of more efficient harvesting and depuration of the harvested molluscs to make them safe for human consumption, the major innovations in production technology related to the development of off-bottom culture and methods of hatchery spawning and larval rearing. Larvae and adults can be reared on selected algae, but so far no inert feeds have been found to be practical for commercial growing, even though experiments have been conducted with fine particles of corn starch and micro-encapsulated feeds (the only exception being the gastropod abalone). In oyster hatch-eries the brood stock is sometimes fed on corn starch.